Previously: 8) Montagu Summers (1880-1948) was a historian of gothic novels, the first of which was written by 9) Horace Walpole (1717-1797) who left his gothic mansion to his former ward 10) Anne Seymour Damer (1748-1795). Like Horace Walpole 10) Anne Seymour Damer was a member of the British aristocracy. Her father was a member of the influential Seymour family and her mother was one of the equally influential Scottish Bruces. Through her aristocratic connections she was able to meet both Lord Nelson and Napoleon (not at the same time). During her parents’ frequent trips abroad in her childhood Anne was put under the guardianship of 9) Horace Walpole, who encouraged her interest in becoming a sculptor. She was trained by several leading sculptors. Her personal and family connections meant that she had no shortage of models for her work, which included King George III. In 1767 Anne married Hon. John Damer. The marriage wasn’t a particularly happy one. They had no children and were divorced after seven years. After John committed suicide in 1776 leaving considerable debts Anne turned to her sculpting to supplement her income. Throughout her marriage Anne took to wearing men’s clothing and showed great affection towards women. Her behaviour produced criticism, and an anonymous pamphlet was published in about 1770 entitled “A Sapphist Epistle from Jack Cavendish to the Honourable and Most Beautiful Mrs. D.” “Sapphist” is a reference to the poet Sappho (featured in my original “80 Gays” series}. In 1789 Horace Walpole introduced Anne to Mary Berry, a famous author. The two women lived together later in their lives. Anne Seymour Damer was also a well-known figure during the 1784 General Election, but not for her sculpture. The election was fought between the Tory Prime Minister William Pitt the Younger (probably gay) and Whig Party leader Charles James Fox. Anne campaigned for Fox. Campaigning in the 18th century included anything from bribery (with money or beer) to something more “personal”. Anne, with several other renowned aristocratic “beauties”, canvassed Fox’s constituency offering to shake hands with voters. Some voters, and this was long before women were allowed to vote, wanted more than a handshake. Soon they asking for a kiss from the “beauties”, which Anne and the “beauties” gave. It is said that this was the reason Fox regained his seat in parliament, but Pitt was re-elected as Prime Minister. Just like modern campaigns 18th century political parties had their own colours. During their campaigning Anne Seymour Damer and the “beauties” wore blue and buff, the Whig Party colours. 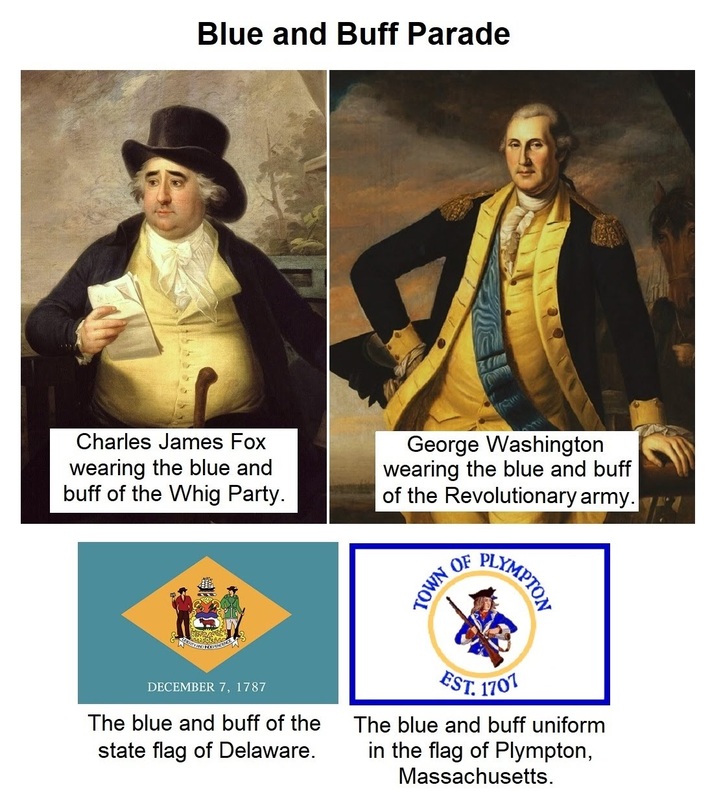 Because the Whigs supported American independence the Revolutionary army adopted blue and buff for their uniforms. Many revolutionary leaders had their portraits painted wearing this uniform, including George Washington. The colours were later adopted in flag of some US states, most noticeably in that of Delaware. Another person who wore blue and buff uniform is prominently featured on the flag of Plympton, Massachusetts. In 1783 a soldier wearing the blue and buff uniform was treated for a fever. The doctor found out this soldier had a secret. This soldier was a woman, 11) Deborah Sampson (1760-1821). The doctor kept her secret while she recovered and then she returned to her regiment. Still living as a male Deborah received an honourable discharge when her regiment was disbanded. Deborah was born in Plympton, Massachusetts, hence her inclusion on the town’s new flag in 2003. After her father died when she was 5 years old Deborah became a farm servant, growing up doing both women’s and men’s work on the farm. She then became a school teacher. In 1781 Deborah decided to enlist in the Revolutionary army. Disguising herself as a man she joined the 4th Massachusetts Regiment and fought in several battles as Private Robert Shurtliff. In her first battle she was hit by two musket balls in her thigh. She begged her comrades to leave her to die but they took her to hospital. Deborah was also treated for a head wound but she left the hospital before the musket balls could be removed so that her gender would not be revealed. With her penknife she removed one of the balls herself. The other was too deep inside the thigh to reach. There’s no conclusive evidence to indicate Deborah’s sexuality. I follow the thoughts of two modern historians. Both suggest that there was some element of queerness. Both refer to an autobiography of Deborah which she co-wrote with Herman Mann and published in 1797. This is now regarded as a highly elaborated account of her life. Among the events described in the book are several romantic episodes Deborah had with women whilst living as a male soldier. Deborah may have exaggerated these romances but one of the modern historians, Keith Stern, believes that she showed undisguised attraction towards women who wanted to be with her. Whether any of these relationships was sexual we’ll never know. As far as can be determined she was only ever in one relationship with a man. After she left the army Deborah married Benjamin Gannett and had three children. There can be no greater proof of a person’s legacy than to be represented on a flag, but even more so to have a law named after you nearly 200 years after you have died. In 2017 US Congress introduced a bill called the Deborah Sampson Act. If passed it will create a pilot programme of support for female US veterans who suffer from financial or health problems. Deborah herself campaigned hard for the right to claim her own army pension which was withdrawn after it was revealed she was a woman. The second modern historian is also cautious to put a definitive label on Deborah Sampson’s sexuality. He agrees with Stern that she found the attention of women pleasing, if only to be happy to pass so convincingly as a man. This second historian wrote a novel based on Deborah’s life. She was a character he had first heard about as a child and wanted his novel to be as historically accurate as possible. After all, he has a personal connection to the pioneering first female American soldier because he was a pioneer himself – he was the first openly transgender student at Harvard University. But more than that, Deborah Sampson was one of his ancestors. His name is 12) Alex Myers (b.1978). Next time: The Study of Queerness, in which Harvard University leads us to the World of Leather.